This&That Café marks its 26th edition with the fine lines and broad strokes of artist “Gerutama,” who celebrates her 10th Anniversary as a live painter this year. As always, the music on offer spans a wide range of genres, from the dream-pop stylings of Tecimerico, to the ebullient Afro/Caribbean sounds of Reggaelation Independence. Don’t miss it! Jamaica.” After appearing at Fuji Rock Festival 2011 and performing as the opening act for Rico Rodoriguez, they released the 1st 7inch EP “Africa-TABU-/Dubrica,” which became a smash hit and was rated very high not only in Japanese Reggae scene but among DJs especially in Europe. emulsion is a Tokyo-based electro duo with shina-G(G) and mika-R(B,Vo, electronics), which has a unique sound style that ranges from math-rock, postrock, electronica and breakbeats, IDM, dubstep, and from ambient to harsh noise. The band explores different playing styles for each event, playing in a rock style for live-music venues, dance music for all-night clubs and open-air parties, and sometimes even improvisation with iPads, Laptops and other electronics / toy instruments. Emulsion toured twice in the US tour twice and took part in several festivals. They often play with touring bands such as Bellini, Jarbow（ex-Swans), Mick Turner (DirtyThree), K. (Ida’s menders’ side project), Art of Fighting, Because of Ghosts, SABOT and so on. In 2008, Emulsion organized a tribute show for “Willie Mae Rock Camp for Girls” in Tokyo and brought K. (Karla Schickele, Ruth Keating, Dan Littleton from Ida) as a headliner. in 2010, they organized a show for the indie festival, “GURU GURU MAWARU 2010” held at Saitama Stadium. 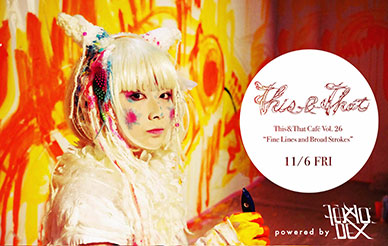 For This and That&That Café, Emulsion will do a special collaboration with live painter BOSSHIKO. Tecimerico was formed in Tokyo in 2009. Our sound combines a cinematic atmosphere with a catchy pop feel, including elements of post-classical music and electronica. Using a unique combination of modern and classical instruments to express our particular view of the world, we put everything we have into our performances. Our musical style is very broad, hence the “Unusual” name. We typically play a back-to-back set. It sometimes creates discordances since our taste and mood can be different, but we appreciate the “wave” that results. Although our musical styles range from rock, indie, reggae, asl the way to dub, funk, jazz, new wave and hip hop, the common ‘roots’ that we often revisit are mostly electronic/techno/house. We have been regular DJs at SNIFF SNIFF (now Roarrr) and CONTROL parties. Paul is English and Sebastien is French Canadian, both based in Tokyo for about 8 years. This&That Cafe is a free event open to the public in which artists from all genres and backgrounds donate their time and talents in the spirt of sharing. It is a place where music and visual arts meld in unexpected collaborations. A forum for artists from afar to meet with local luminaries amidst the dense and eclectic pool of talent in Tokyo. A venue to gather, exchange ideas, share artistic inclinations and wax poetic in a causal community of old friends and new acquaintances. Come early to get a seat and take advantage of the fetching fare on the SuperDeluxe menu, or just pop in for a drink on your way home from work. All are welcome. If you have an idea for a future This & That Cafe event, please drop a line to <[thisnthat@tokyodex.com](mailto:thisnthat@tokyodex.com)>. We look forward to hearing from musicians, DJ, visual artists et al looking for a new and exciting venue for their expressions.